In the early days of September, 1999 the President of Bolivia Hugo Banzer signed a contract with the Bechtel Corporation. This contract privatized the water supply of the Bolivian city of Cochabamba under the ownership of Aguas del Tunari, a subsidiary of the Bechtel Corporation. President Banzer and Bechtel representative Geoffrey Thorpe were at a party celebrating the signing of the contract when protesters from Cochabamba arrived outside and began chanting in protest to the agreement. Upon hearing the protests, President Banzer said to Geoffrey “I’m used to that background music.” In the early 1950’s, the workers, miners, and farm laborers of Bolivia united under the National Revolutionary Movement Party (MNR). In 1951 they ran Victor Paz Estenssoro as their candidate and won a decisive victory. The military at this point stepped in and placed General Hugo Ballivian as Dictator of Bolivia. In April of the next year, the MNR had armed themselves and in a three day struggle, took control of the government and put Estenssoro in power as he should have been based off of the vote. The workers of Bolivia called for the nationalization of the mines, universal suffrage that included the indigenous population, and agrarian reform as well. This movement to push Estenssoro to implement these reforms was put forward by a grassroots campaign in Bolivia that involved large-scale mobilizations of the masses. In 1952 the MNR sought to put the wealth of Bolivia into the hands of the masses. This did not happen. President Estenssoro, on May 14, 1953 began to implement policies pushed by the World Bank and the International Monetary Fund (IMF). At this point large-scale privatizations were not included but they would later be introduced. These reforms led to a dramatic increase in inflation which tripled the cost of living in Bolivia. Throughout the decades that followed, International economic institutions such as the IMF and the World Bank pushed neoliberal economic policies onto the Bolivian Government which included the privatization of state-owned industries such as the mines, the gas industry, and, as we will see in Cochabamba, the Nation’s water supply. The privatization of Cochabamba’s water supply was a substantial violation of the right of the Bolivian people to have access to clean drinking water which, after all, is more valuable than any oil well or goldmine. This video shows Maude Barlow speaking about the Water War in Cochabamba at the International Forum on Globalization. The video also includes graphic footage of the violent clashes between the protesters and the riot police during which multiple people were arrested and wounded and one seventeen year old boy was killed. Protesters hold up a signing demanding that the Bechtel subsidiary, Aguas del Tunari, cease its operations in Cochabamba. 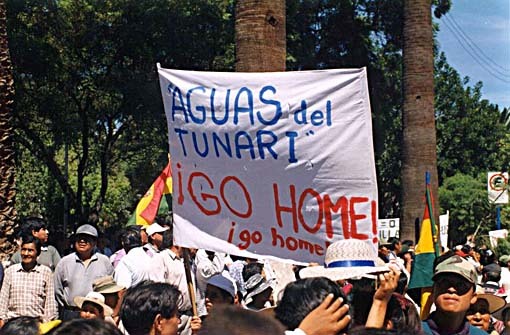 In November of 1999, what became known as the Water War began as protesters in Cochabamba clashed with government riot police and soldiers. This clash involved policemen in riot gear firing tear gas at protesters who retaliated with rocks and in some cases Molotov cocktails. This conflict started in 1996 when the World Bank strong-armed the Bolivian government into signing an agreement with the Bechtel Corporation by threatening to withhold $600 million of debt relief funds. This deal was finalized in 1999 and gave ownership of Cochabamba’s water supply for forty years and provided guarantees that they would make a sixteen percent profit annually. Aguas del Tunari gained control of the irrigation systems and community wells in the rural areas. This was despite the fact that most of these systems and wells had been designed, built, and financed by the locals that lived there. Aguas would even bill people for collecting rainwater or drinking from their own wells. Shortly after the deal was finalized, Aguas raised the rates that people had to pay for their water services. Sometimes this raise was as much as 200% in some areas. Water costs in Cochabamba ended up being around $15-$20 per month. Considering that the minimu m wage in Cochabamba was $60 per month, this left the city’s poor paying 25%-33% of their income just on water alone. All of this was done by the Bechtel Corporation with specific objective being to maximize their profit while the well-being of the people was relegated to the back seat. The Bolivian people responded with a grassroots campaign to push the Bechtel Corporation out of their water supply and their right to clean water at an affordable cost.